Located at 32 Balliniska Road, on the Springtown Industrial Estate, the new branch is the eighth in the company’s growing portfolio and helps strengthen Stevenson & Reid’s position as a leading force in the plumbing and heating supply industry in Northern Ireland. “It’s a new venture in a new market, but it’s got great potential and we are responding to a demand from customers wanting us to set up shop in the L’Derry area,” said Johnny Adair, Area Showroom Manager. “We already have branches in Ballymena, Ballymoney, Bangor, Belfast, Cookstown, Newtownabbey and Omagh, and we felt it was a natural progression to expand into the North West of the province too, especially with it being home to the second city of Northern Ireland. “We had pondered on the idea for a few years and finally decided the time was right – the business as a whole is going well, and with Area Sales Representative, Stephen Bradley, already working in the L’Derry area we had great feedback about the growing demand for our expansion there. The new branch will help us to consolidate the good work he is doing to build up a solid base in the North West,” explained Johnny. The site chosen for the new branch is located at the former premises of McConnell Engineering – conveniently situated on the edge of the city and with ample car parking. The old building was extensively renovated and revamped to fall in line with the Stevenson & Reid vision, including a new Studio Bathroom showroom and accompanying trade counter. 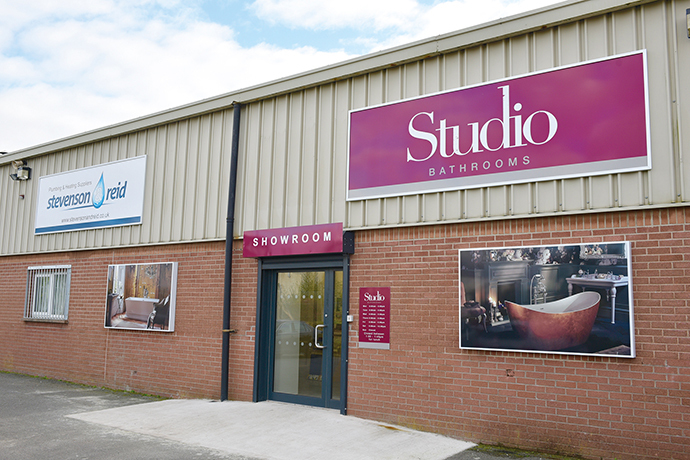 After only a few short months of opening, the new bathroom showroom and trade counter are both enjoying high volumes of business from both trade and retail customers.